Allow me to jump out in front of the hypocrisy that you will most certainly call out for writing this post. As an independent writer of online content, I, like many others who would prefer to spend their days spouting their thoughts to the internet community, would be thrilled to find out that my articles were being shared, re-posted, and talked about in the thousands upon thousands of offices filled with able-bodied yet mentally trapped day-jobbers. And to be considered by academics as a provocative writer, who uses pop culture and current events to inspire conversations of a depth that the mainstream media literally cannot afford, would delight my ego and validate my life of questionable sustainability (my mother is a worrier). Since I continue to subsidize this life choice with freelance work in advertising, my reliance on growing an audience is not be as crucial as it is for established websites, where the rewards are based on impressions, clicks, and visits. Still, aspiring to be recognized by those vaguely aforementioned websites has exposed the limits to the rewards I seek. As easy as it can be to pity the office workers who lack the nerve to do what would give their lives meaning, my own pursuit has not exactly proven that they have made the wrong choice. While they scramble to appease clients or stress over reports that no one will read and presentations that no one will remember, at least they spend that time in exchange for the ability to feed their families, go on vacations and buy the organic stuff. Meanwhile, my quest to inspire dialogue about society—and stroke my own ego for coming up with such an interesting way to do it—couldn’t pay for candles, much less a light bill. So shame on me for validating my life with respect to an opinion of those who are “not brave.” Most desk jockeys already have their audience, whereas I have to continually find ways to build mine. Such is the struggle throughout the internet community. With new sites launching every second, the options for content are virtually infinite, and our collective attention span has suffered the glut. What has resulted is a dog-eat-dog frontier that changes the meaning of “www” to something that more aptly describes this media culture that values ‘Being FIRST’ over ‘Being right.’ And with eyeballs replacing gold in this modern day rush, being blatantly derivative has proven more reliable pay dirt than originality. 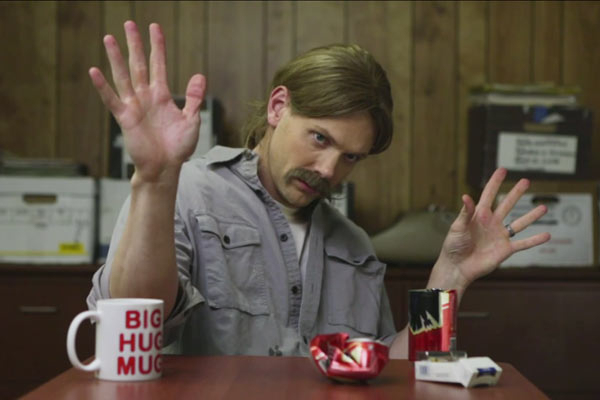 I don’t know about you, Humanoids, but I’ll go ahead and not watch any of these True Detective spoof videos. Call me uptight for valuing the quality of a television show so highly above parody, but I call it hack comedy in an environment where people are doing ANYthing to capture the dwindling attention of the internet community. Sure, “imitation is the sincerest form of flattery,” but how sincere is it when it can distract from a story that hasn’t even concluded? The last thing Nic Pizzolatto wants people thinking about while his show airs is how awesome that one guy’s McConaughey impression is. I recognize my hypersensitivity over this…but I assure you that it’s in the name of pushing for originality and respect, a subjective argument indeed. You’re right, Joel Cohle; The Soup is all about being detached. You’re off the hook. As I mentioned earlier, I acknowledge the irony of deriving my message from content that derives from other content, but the hypocrisy does not negate that the financial reliance on the online appetite lends itself more to the familiar than the original. In fact, being an active participant in the conversation surrounding a video making fun of a video proves my point. And in making fun of myself, and calling out my own place in this machine, I hope that you will take seriously my point that in veering away from originality, we (as creators and consumers) forfeit sincerity that our culture cannot afford to lose. Although we appear to give people unfettered access to our lives (through Facebook, Instagram, Twitter, and any other place that will have us), what we’ve actually done is cultivated identities that we can safely submit for approval, a conscious assessment of what we are willing to give up while still maintaining self-esteem. In so doing, we divorce ourselves from the possibility of making our emotional stakes plain if those stakes deviate too far from accepted norms. And since everyone has agreed to this arrangement, the table is set for those who go against the grain to be dismissed outright or briefly considered novel in their bravery. Alas, the negotiation of what will get attention versus what deserves attention does not favor the more rewarding aspects of the creative process, wherein expression of provocative ideas stands to make the world a better place than the one we were born into. In that way, the online profit centers differ little from the broader sensationalist media in that the metaphorical low hanging fruit of parody is what affords editors of those sites the actual non-GMO fruit they have been told is better for them. There is no doubt that parody has a place in our culture, and there is nothing absolutely noble in my decision to take umbrage with people using a television show I enjoy as a springboard to compete for the attention we all want. Of course, from a business perspective, waiting until True Detective ends (this Sunday) to post parody videos would be imprudent. And making light of a serious piece of fiction reminds us that we should take nothing on television too seriously. But considering how much time we spend tethered to computers, smartphones, and televisions, there have to be moments when engaging with those devices that fiction can make the intended impact of the creator without the desperate clamor of bloggers and sketch comedians feasting upon it for their own gains. Perhaps this article has been the most worthless 1200+ words you have ever read because what I have described is life as it is with no signs of change. But I would be remiss if I did not at least point out (however self-servingly) the reality that may not be as clear. After all, who has the time to stop and think about the competitive nature of creating online content with so many Buzzfeed quizzes to take and cat videos to watch?